Now this is nice... Here's a look at the Cindy Clawfoot Qee done by Jeremy Gibbs for this weekend's upcoming Monster Mash show. Apparently Cindy Clawfoot was one of the first Supermonsters and is the quite the diva; she won't even get out of bed for less than 15,000 calories! This one is darn near perfect. Jeremy's gone all out to transform this once humble Qee. Check out all the plastic (err sclulpey) surgery! What I love though is how well he incorporates the Diva aspect into the piece -- from the haunting eyes to the monochromatic blue color scheme. This monster certainly has a refined aire to it. As an example check out the "fins" -- with their undulating shape and color scheme they most clealry belong to a female monster ;-) This piece really highlights Jeremy Gibbs' amazing technical skill as well as his ever increasing artistry. The Monster Mash show should be amazing. Haven't heard of it? Basically artists contribute an original monster on whatever medium they like. Then Monsters are pitted against one another with the audience determining the winner by vote. So it's art show as monster duel! Great idea. The qualifying heats start this Sunday (01.08) at Here Gallery in Bristol, England. Oh btw, got your Monster Mash Cards? No? Go get 'em. 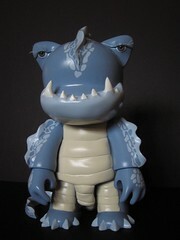 The excellent custom toys and art from the Crossover show are now available online directly from Rotofugi. 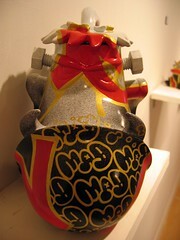 Participating artists include: Sket One, MAD, Nakanari, B.B. Birdy, Andrew Bell and Attaboy. Check out what's available here. 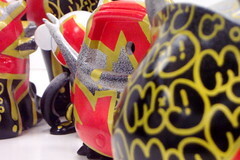 Here's a teaser of MAD's new piece for the Chicago opening of Crossover at Rotofugi this Friday (July 8th). Recognize the figure? 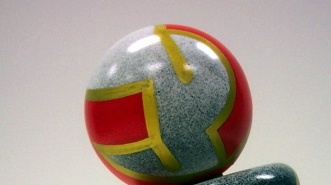 Here's a teaser image of Nakanari's new piece for the Chicago leg of Crossover which opens this Friday (July 8th) at Rotofugi. I love this piece -- loads of detail and the feathers are a nice touch. If you're wondering what the figure is, it's a "Havenboy" from Monster Taipei. Ben (Nucleus) and Jeremy Madl Jack and I were at Nucleus last night for the Cross Over opening reception. 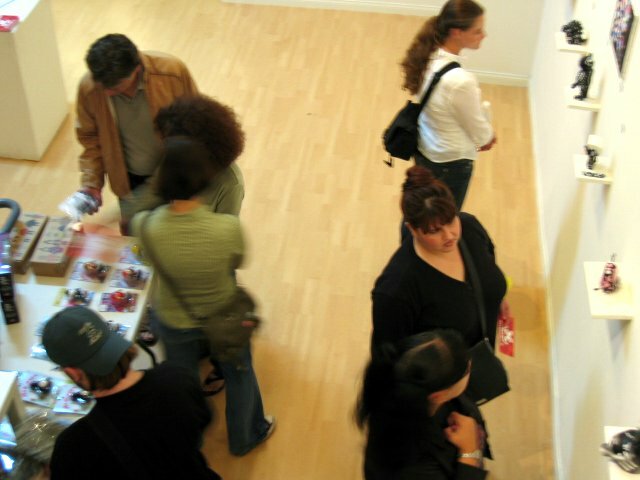 The pieces on display varied in styles. 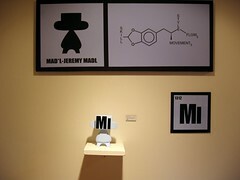 There was a flocked Groob by B.B.Birdy, Sket One’s Periodic Table theme set, Nakanari’s “Dark Side” toys. The prices were also all over the spectrum, from a $600 Andrew Bell’s Hunter Dero to a $60 Attaboy’s Funny Club Annamonkey. 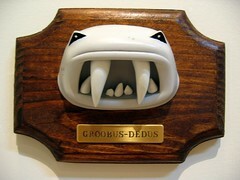 There was even a UHF Groob for only $65. 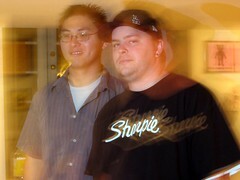 It was initially listed for $25 until someone mentioned to the owner of Nucleus that it was under-priced. I think the owner didn’t have a clue as to what precious cargo he had in his gallery. But some people knew how awesome the toys were, because even before the show’s opening, someone offered to buy an entire set of the designed toys. Mad was present and as usual he was very friendly. He spoke with a handful of fans about the process of the creation of his designs for the show. The details of his pieces were all done with Sharpie pens and each one took him at least 8 hours. Despite the need for some shut eye, Mad spent a few hours hanging around the show,while he waited for Richard of Wheaty Wheat, who arrived shortly after we left around 10:30 p.m. The show ends on June 25, 2005 and it will be going to Rotofugi in Chicago on July 8th. So, make sure to stop by Nucleus before they leave town. 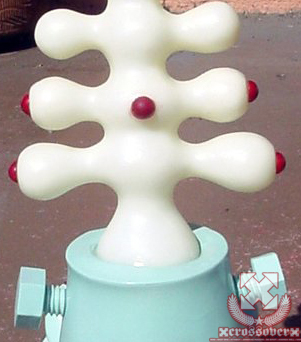 The pieces are available for purchase via Nucleus’s website. A detailed write up by Jack will appear in a future issue of Playtimes, more info coming. 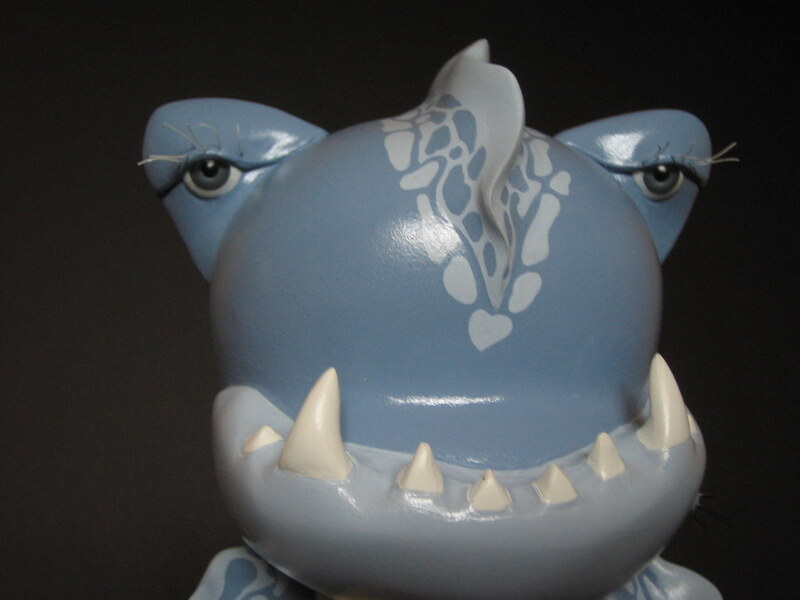 Our final Cross Over preview features eye-blowing custom designs by MAD including Groob (by Andrew Bell) front and center with some of his friends in the background. MAD meticuously carried the great design concept over to each of the 5 pieces shown (or partially shown) here. Check out the grayish speckled effect on the base layer and those tight lines done with his weapon of choice, Sharpie Markers. MAD's art and that of the other Cross Over artists including Sket-One, Nakanari, b.b. birdy, Andrew Bell, Attaboy, and Jermaine Rogers will be available at Nucleus in Alhambra from June 4th through June 25th. 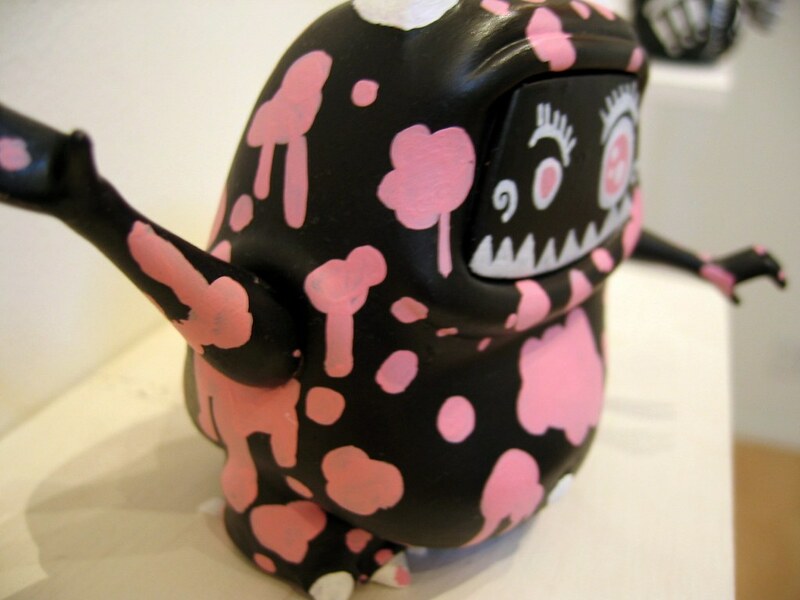 Drop by the gallery tomorrow night (Saturday, June 4th) from 7 PM to Midnight for the opening chock full of custom toys, canvas art, free booze, and of course MAD in person! Today, we have two Cross Over previews. This first one is loaded with 5 customs from Nakanari of the Eggster (Sket-One), Dero (Jermaine Rogers), Mad*l (MAD), Groob (Andrew Bell), and Axtrx (Attaboy). 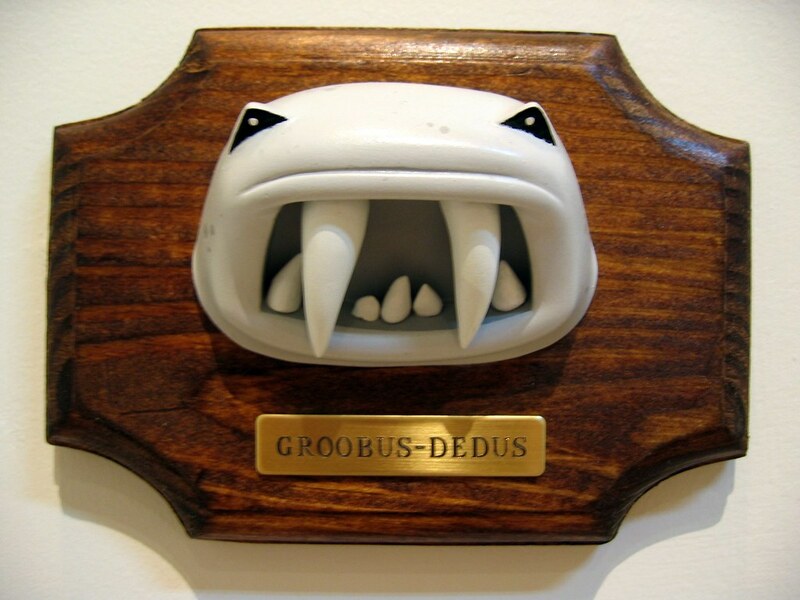 Groob has never looked more stylish ;-) Drop by the show opening tomorrow night --Saturday, June 4th (7 PM - Midnight) -- at Nucleus to gaze at all the custom toys + canvases. Say... Where's the second (and final) preview? Check back later this afternnon -- it's well worth the wait. Honest! For today's Cross Over sneak peek we have Sket-One's interpretation of the Axtrx figure (by Attaboy). Each of Sket's Cross Over offerings come as a set of a large canvas, customized toy, plus a little something extra not pictured here. 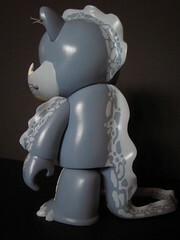 Want to see the other vinyl toy 'elements' in Sket's universe? Swing by Nucleus in Alhambra, CA Saturday, June 4th (7 PM - Midnight) for the show opening. 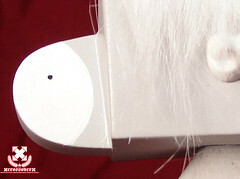 Also, be sure to check back tomorrow for another sneak peak. 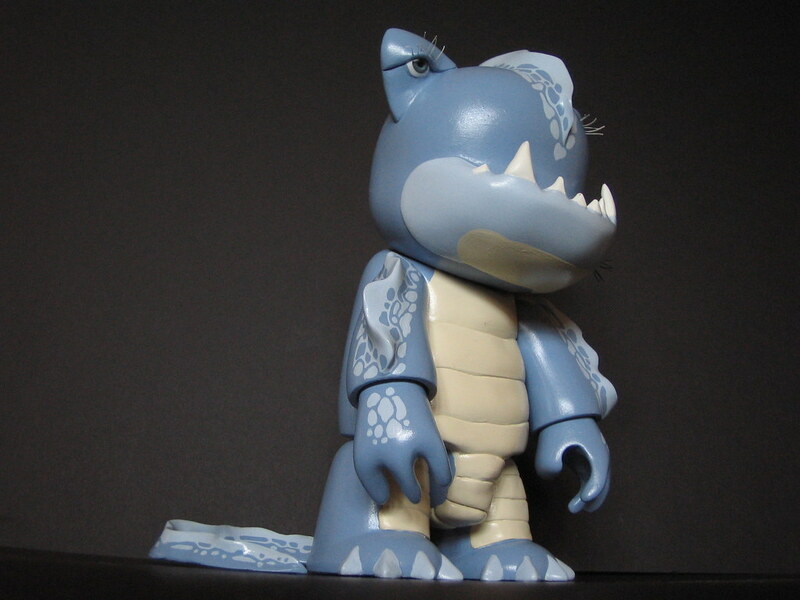 Attaboy's custom interpretation of the Eggster (by Sket-One) is today's Cross Over Preview. What's growing out of the Eggster? Not sure, but it's GID ! See all the great pieces at the show opening on Saturday, June 4th (7 PM - Midnight) at Nucleus in Alhambra, CA. 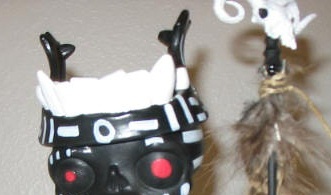 Check back tomorrow for a preview of another great Cross Over piece. 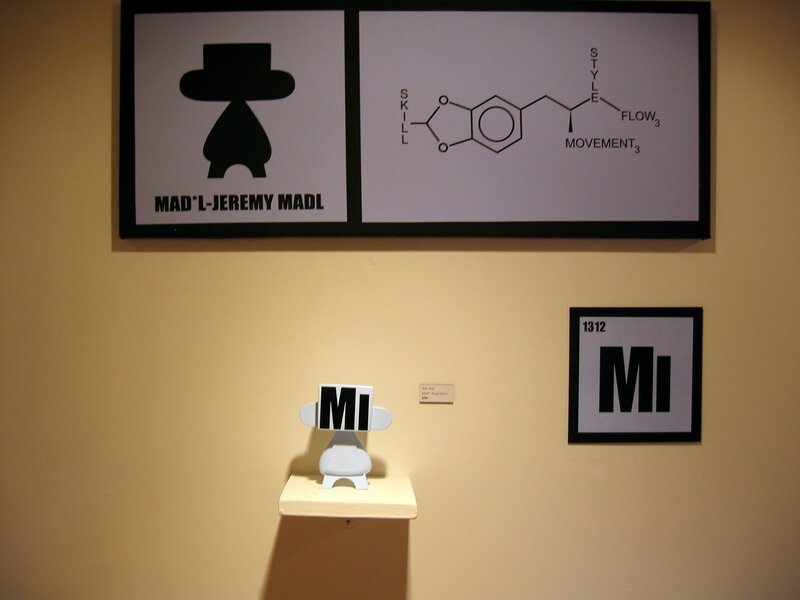 For today's Cross Over sneak peak, we have Andrew Bell's MoosL, his interpretation of the Mad*l (by MAD) figure. I love this little guy -- the expression is priceless. We'll be previewing a different Cross Over piece each day this week so be sure to check back here. Want to see more? 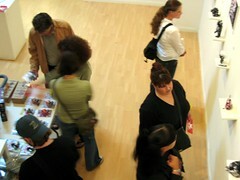 Come out for the opening on Saturday June 4th (7 PM - Midnight) at Nucleus in Alhambra, CA. After the opening, we will have full coverage of all the show pieces. What is MoosL SO afraid of ?? ?